Among other symptoms of Addison's disease it is necessary to distinguish atrophy of muscles and muscle weakness, as well as an obvious violation of the functions of such vital systems as cardiovascular, respiratory, digestive and endocrine. Against the background of this dysfunction, the increased pigmentation of the skin progresses, and the mucous membranes acquire a bronze hue. That's why the corresponding name is bronze disease. 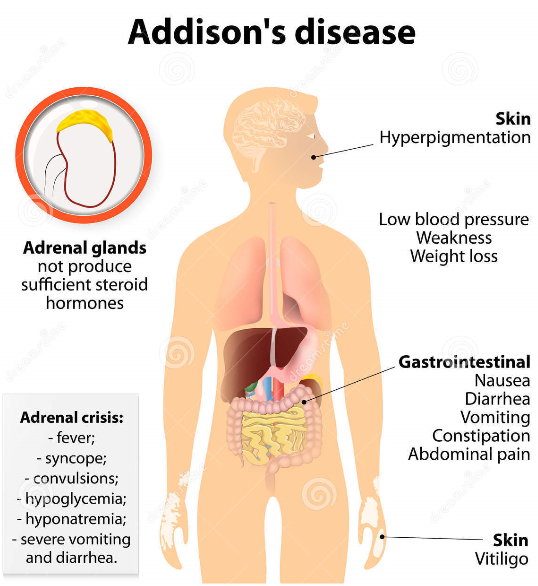 Addison's disease progresses gradually, and starts with a general malaise, which a patient refers to changes in weather and physical fatigue. Soon, there are the first problems with digestion, which also negatively affect the work of the nervous system. So, a patient experiences the tides of aggression, which alternate with passivity and depressive states. Then the skin changes color and the obvious symptoms of pigmentation become an occasion to contact a specialist for detailed advice. Symptoms of a characteristic ailment can be primary and secondary, but already in neglected clinical pictures a patient notices that he begins to consume a huge amount of salt. It is an alarming sign that should draw close attention to one's own health. If there is a crisis, then it is accompanied by symptoms such as hypotension, diarrhea, vomiting, loss of consciousness and abdominal pain. Here, medical intervention can no longer be avoided, and resuscitative measures must be followed immediately. Otherwise, a patient may die. However, sometimes it happens that a patient does not pay attention to the problem, believing that his body is in order. In fact, this is life-threatening, since delay in diagnosis dramatically worsens the general condition and can lead to an unexpected death. That is why the first symptoms of Addison's disease should be discussed individually with the attending physician. Making the final diagnosis without detailed diagnosis is very difficult, therefore, in this clinical picture, doctors rely on the results of laboratory and clinical examinations. However, the accent is still worth doing the analysis, which allows you to judge the function of the adrenal cortex. As for the instrumental examination, computed tomography and radiography are required, which in turn determine the nature of the disease and the degree of progressive pathological process. When the clinical picture is finally clear, it's time to immediately begin to treat Addison's disease. With Addison's disease, a treatment approach must necessarily be comprehensive, but cover all aspects of a patient's life. First of all, it is important to adhere to the therapeutic diet, and for this individually visit a nutritionist. Food should be enriched with proteins and proteins, but fats should be exclusively vegetable origin, carbohydrates - easily digestible carbohydrates, and vitamins and antioxidants are mandatory. But products rich in potassium, it is best to exclude from the diet, and for their compromise replacement to remember the chemical composition of table salt. In more advanced clinical pictures, the endocrinologist prescribes hormonal therapy, which is represented by a long-term intake of glucocorticoids of mineralocorticoids. It is extremely important to dose such medications, and the way of application and daily doses should be stipulated strictly on an individual basis. In the case of the progression of addisonic crises, urgent hospitalization is necessary with the implementation of resuscitative measures to stabilize the patient's overall well-being.